Image courtesy of Library of Congress This image features a Hearst newspaper truck from New York City delivering a petition to the Capitol bearing more than one million signatures in support of a bonus for World War I veterans. On this date, a Hearst newspaper truck from New York City delivered a petition to the Capitol bearing more than one million signatures in support of a bonus for World War I veterans. Momentum had been building for several years for the federal government to compensate servicemen for the difference they lost between pay in the military versus their civilian jobs. 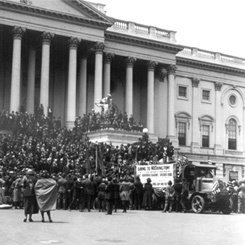 The document simply read: “We respectfully petition Congress to pass the soldiers’ bonus act without further delay, and also to levy a sales tax to obtain the money to pay the bonus.” A delegation of House and Senate Members, led by Lester D. Volk of New York and Hiram Johnson of California, accepted the petition on the central steps of the East Front. Inside the House Chamber, the reception was markedly cooler. Representative Walter Lineberger of California, who supported the bonus, nevertheless dismissed the petition ceremony as a “pageant” intended to “commercialize or politicize patriotism.” Lineberger claimed newspaper publisher William Randolph Hearst orchestrated the event to boost the re-election prospects of Senator Johnson. Hearst had used his newspapers as powerful outlets to oppose U.S. intervention in World War I. Now Lineberger pilloried the Hearst chain, “whose slimy trail of pro-Germanism and traitorous utterances . . . [carried] on the nefarious work of opposing the war and obstructing the path to victory,” for positioning itself as servicemen’s advocate. Congress passed a bonus in 1922 but President Warren Harding vetoed it. After passing another bonus bill, Congress overrode the veto of President Calvin Coolidge in May 1924 and the measure was enacted. The payment—which provided veterans $1.25 per day for service overseas and $1 per day for domestic service—was deferred by the law until 1945. The issue was reopened in the early 1930s, when cash-strapped veterans suffering the effects of the Great Depression marched on Washington to demand an immediate payment.